We also asked which apps birders use to learn bird sounds. Here are the most popular apps for learning calls and songs. Illustrations of younger birds, molting birds, ducks in eclipse... basically, all the ways a species may look when it isn't an adult male in breeding plumage. The ability to search and submit sightings to eBird, with bird songs, taxonomic lists of most common birds to the area, photos/drawings, and recorded calls. What did you learn from these survey results? Anything seem interesting or surprising? Let us know in the comments. 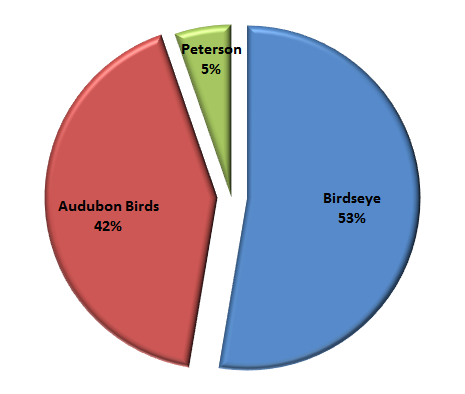 I'm not surprised by Birdseye and Audubon Birds being the most used to find birds with eBird data. They both perform that function very well and accurately. 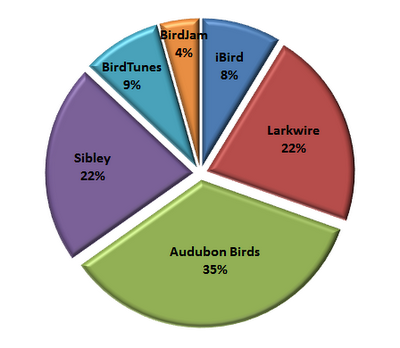 I am surprised the Audubon Birds is the most used app to learn bird sounds. I think this due to the affordability of the app. Larkwire is probably the most intensive app specifically created for this purpose and an app I am very fond of, so I'm glad to see it getting noticed and used. I'm not surprised that bird sounds are the most important app feature for birders as that and portability are the major features that make app more desirable in the field than paper field guides. I am surprised that more birders want photograph in apps than illustrations. Interesting! Not that much importance for the alphabetically list of birds. Funny. I use that all the time. I also wonder if sharing digiscoped photos and connecting to social networks won't increase over time or if that utility is dead on arrival. There seems to be a theme to the dream birding app features...ability to identify birds by the device recording or listening to the call. That would be pretty cool! For more Birding App Survey information, please check out the BirdingIsFun.com page dedicated to that purpose.